Not only did George Bomford (25.1) mortgage much of his own property but also he and his son, John Francis (30.3), were trustees of a number of marriage settlements. Neither the mortgages nor the settlements have been fully investigated, but what has been discovered has been included. The Caulfeilds of Westmeath were cousins of the Earl of Charlemont of Co Tyrone. There were two Caulfeild -Winter marriages and one Caulfeild - Preston marriage. The first one to occur was in February 1834 between the Rev Thomas Gordon Caulfeild of Benown Glebe, Co Westmeath, and Elizabeth (Eliza) Winter (20.6 No 6). Elizabeth was a sister of Arbella Bomford (1810-1900) and George Bomford was the trustee of the marriage settlement. Elizabeth was granted £2,000 by her father, John Pratt Winter, which was charged on the lands of Castletown and Kinnetty; Thomas Caulfeild received two sums, one of £300 and the other of £1,700 from his family. They had no children and Elizabeth died the same year that she married (? - see 20.6), so George as the trustee had no particular problem. I have not seen the marriage settlement which has been extracted from Forth who in turn extracted it from John Pratt Winter’s History of the Winter Family. In it the Rev Thomas is recorded as being the son of Lieut James Caulfeild, Royal Navy, but according to Burke (correctly, according to Richard Caulfeild Hawkes in 2006), James was his brother and their father was Col. William Caulfeild (buried 31 May 1831 at Benown) of Benown. (Another William Caulfeild, who died in 1839, is thought to be another brother of Thomas; the Benown registers may be able to confirm that.) The date of the settlement from the History is 22nd June 1832 but the marriage did not take place until 4th February 1834. The second Winter - Caulfeild marriage was in 1850 between Major Francis Winter (1805-1883), son of John Pratt Winter, and Anna Julia Caulfeild, the eldest daughter of Colonel John Caulfeild (1792-1865) of Bloomfield, Co Westmeath, (20.6 No 7). Major Francis Winter was a brother of Arbella Bomford, and Anna Julia (died 1909) was a niece of Rev Thomas Gordon Caulfeild who married Major Francis’ sister Elizabeth. Their marriage settlement has not been found so it is not known who the trustees were. The third marriage was in 1865 and was between Augusta Florence Caulfeild, a younger sister of Anna Julia and daughter of Colonel John Caulfeild, and Nathaniel Francis Preston (1843-1903) (18.7.4). He was the nephew of Samuel and Frances Jane (Winter) Bomford (26.2.1) and they were his guardians; he was also the grandson of Frances Rose (Bomford), 1792-1831, and Samuel Pratt Winter (18.6). A deed of 1867 (Book 22, No 53) gives details of the marriage settlement. The trust was arranged by Augusta’s brother, Robert Caulfeild (1829-1905) then of Bundoran, Co Donegal, and a major in the Madras Cavalry; he was later of Camolin House, Co Wexford, and a Colonel in the 7th Madras Cavalry. The two trustees were John Francis Bomford and another brother of Augusta, St George Caulfeild (1837-1898) formerly of the 108th Regiment of Foot, later to become the Royal Inniskilling Fusiliers, but at the time of the deed he was Asst Superintendent of Police of Poulquant in South Malabar, Madras; later he retired as “Colonel, Madras Staff Corps”. In February 1889 (Vol 8, No 156) John Francis terminated his trusteeship, no reason was given, and instead Laurence Bomford Molloy of Glendis, Waldeeth Avenue, Bedford in England, took on the trust. This deed is interesting since it re-introduces Laurence Bomford Molloy who last appeared in paragraph 8.9 under the marriage of Anne Bomford, daughter of Edward Bomford of Hightown, and John Molloy of Clonbela dated 4th June 1755. Laurence Bomford Molloy is the great-great-grandson of Edward Bomford. A further deed of February 1890 (Vol 9, No 292) amends Laurence Bomford Molloy’s address to Clonbela, Parsonstown (Birr), King’s Co, and so he was back in the family home of the 1730s. This last deed caught up with John Francis when he was on Land Commission work at Kilbeggan; those who witnessed his signature were the Kilbeggan Hotel proprietor, Thomas Kelly, and John Golding, assistant land commissioner, of Galway. In October 1876 (Vol 54, No 129) there is a seven-page Caulfeild deed in which John Francis Bomford of Drumlargan is a party. It would appear that this was a mortgage given by John Francis to St George Caulfeild of £1,294 and the deed records that the money was repaid to John Francis and that he has freed all the Caulfeild lands in Co Westmeath, which were involved. It is doubtful if John Francis had that amount of money to lend so it is likely that he was only acting as a trustee, perhaps as a trustee to the Caulfeild - Preston marriage settlement. George Bomford of Oakley Park witnessed the deed. Another long Caulfeild deed is recorded in March 1877 (Vol 24, No 46 & 47) in which John Francis Bomford and Nathaniel Francis Preston of Swainstown were trustees. 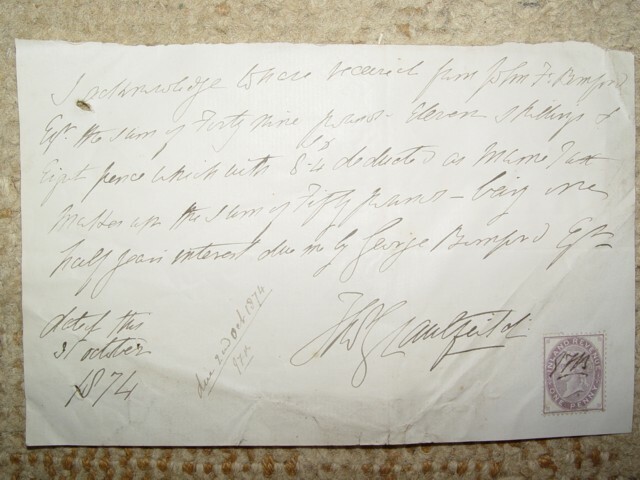 This would not have been the Preston - Caulfeild marriage of 1865 because Nat Preston could not have been a trustee of his own marriage settlement, but it could be yet another Caulfeild marriage. When George Bomford married Arbella in 1832 (24.1) all his lands were “free from any incumbrances except for £4,000 according to the marriage settlement (of George’s father, 18.8.4) dated 1st March 1809 which is due to the only younger son, Samuel Bomford.” Shortly after his marriage George bought Baltrasna and Oakley Park, which were also free from any mortgages, so, initially, George’s only debt was the £4,000 due to his brother. This state of affairs did not last long and in July 1832 George borrowed £1,000 from John Thomas Hinds, a solicitor of Westmoreland Street in Dublin, at 5% interest. It is difficult to follow through these mortgages since the records do not always give the full story; for instance in this loan we do not know the penalty figure, nor the lands on which the debt is charged. However in this case a deed of 15th February 1861 (Book 9, No 80) states that the £1,000 borrowed in 1832 was charged on Drumlargan and Clonfad, and that it has to be paid back by 15th February 1862. George could not find the money in 1862 so John Thomas Hinds took him to court and “on 10th July 1862 he obtained a judgement in the Court of the Queen’s Bench against George Bomford for £2,000 plus £3.1.11 costs” ( Book 28, No 199). In other words the penalty figure of £2,000 was invoked rather than the actual loan of £1,000, so George now has to pay the 5% interest on the higher figure and pay back double the original loan - a costly mortgage, and if he cannot then he will loose the lands charged. Hinds continues to demand his money and so George persuades his wife’s sister’s husband, Rev Thomas Gordon Caulfeild of Mount Temple, Co Westmeath, to put up £1,000; this is related in the deed of February 1868 (Vol 8, No 144 & 145) in which John Thomas Hinds received £1,000 from Caulfeild and the lands of Drumlargan and Clonfad are transferred to Caulfeild. However the deed continues, “there remains the sum of £1,003.1.11 which is now laid upon Oakley Park” at 5% interest with the penalty figure of £2,000, and which continues to be a mortgage of John Thomas Hinds. This mortgage might be the subject of interest on £2,000 paid later by John Francis Bomford to Colonel Robert Caulfeild, see 31.3 below. In October 1863 John Thomas Hinds obtained another judgement against George for £800 plus costs of £3.1.11 ( Book 37, No 65). It is not really known how this mortgage came about, but it is thought that perhaps it has to do with George’s eldest son, George Winter Bomford. Amongst the documents is one dated 7th October 1856 headed “Costs of Loan of £400” which states the plaintiffs, Joseph Barnes and Arabella Abbott, obtained a judgement in the Court of Common Pleas for the sum of £1,600 against George Bomford. It is suggested that possibly George Winter Bomford borrowed £400 when he was still a minor, he was 21 in 1855, and that his father had to take over the debt which, due to non-payment, had increased from £400 to £1,600, the two sums mentioned in the document. The Document itemises the costs, amounting to £7.7.10, of registering the £1,600 as a mortgage by George on Oakley Park. No reference to any of this was found in the Registry of Deeds and it must be left as a mystery. Nothing is known about the two plaintiffs although a Joseph Barnes witnessed the deed of 1835 concerning the repayment of the Tullyard mortgage to George Bomford (18.8.5), and he may be a son of Thomas Barnes of Westlands by his second marriage (25.2.2). In January 1857 George obtained a judgement against his son, George Winter Bomford, for £1,600 and stated that his son had taken over the lands of Drumlargan for his own benefit. This matter has been discussed in the last chapter to a limited degree (30.2.1), but if we put all these deeds together they begin to make sense. By June 1857 George Winter had been able to raise £800 of the £1,600, possibly from the rents of Drumlargan, leaving £800 outstanding; his father then took over the outstanding £800 and raised a mortgage with John Thomas Hinds which was the judgement mentioned initially in October 1863. In April 1868 (Vol 15, No 128) George William Ruxton and Richard Knott Bolton took over the mortgage and, one assumes, paid off John Thomas Hinds. George Ruxton was George’s son-in-law (30.4) and Richard Bolton was John Francis Bomford’s brother-in-law (30.3.2). So once again the ‘in-laws’ of the family had come to the rescue and saved George Bomford from losing his land. In addition to the £4,000, which was still due to Samuel (31.2), there was a further £10,000, which George borrowed from him in August 1837. All this has been discussed in Chapter 26, however in 1861 George asked Samuel if he could defer the payment of £4,000, otherwise he will have to sell some land; Samuel agreed and “assigns the £4,000 payment to be charged upon the land at the usual interest” which one assumes to be 5% (26.4.1). Some of this total debt to Samuel of £14,000 appears to have been paid off before, or just after, George’s death since the amount listed in 1889 was £12,300 (31.3). In Chapter 29 the Neville mortgage on Clonfad was considered. In 1865 John Francis Bomford inherited Clonfad together with his father’s mortgage of £3,000 at 5% interest. John Francis finally paid off this mortgage by selling Clonfad. 1. £1,000 due to John Thomas Hinds and charged on Oakley Park. 2. £1,000 due to Rev Thomas Caulfeild and charged on Drumlargan and Clonfad. 3. £ 800 due to George William Ruxton and Richard Knott Bolton and charged on Oakley Park. 4. £12,300 due to Samuel Bomford, some of which was charged on Oakley Park. 5. £3,000 due to Robert Neville and charged on Clonfad, initiated by George but now belonging to John Francis. These come to a total borrowing of £18,100, two thirds of which was due to Samuel. If we assume an interest rate of 5% this means that George or his son had to find a little over £900 each year. This was not a particularly large figure for many landowners of those days when one considers some of the estates which were in debt. As many as 3,000 estates had been sold as a result of the “Encumbered Estates Act” of 1849. However it was not easy to sell an estate which was bound by entail, limited by family settlements and charged with mortgages. It is very doubtful if George ever considered selling; he had an income from the land of something over £4,500 net, so the interest could be met. In any case the 1850s and 1860s were prosperous years for Irish agriculture, and prices favoured the farmer. It was not until the late 1870s and the early 1880s that the trade depression of Britain caused prices to slump; the year 1879 was especially critical because of the disastrously bad harvest, and this would mean that people like George would have little income since the tenants got nothing from their harvest with which to pay their rents. In 1881 the “Judicial Rent Act” was passed and, on average, rents dropped by about 20%. George and John Francis, who had seen that their tenants could not sustain the previous high rents, had already lowered the rents in many areas. Nevertheless there was a 20% cut in their income and they now had to watch expenses. By the mid-1880s income was down to about £4,000, and at the time of his death it was down to about £3,500; but even this lower figure was still sufficient to meet the interest demands on his mortgages provided the capital sums were not demanded. If that situation should arise then it would be necessary to sell land. In March 1886 George died and left his property to his wife Arbella to administer (32.3). However Arbella was aged 76 so in practice John Francis had to keep a watching brief on the estates; but he was living at Drumlargan and his mother at Oakley Park, so it was not easy for him; furthermore he had to tread gently since his brother and sisters who were living at Oakley Park were living in a persistent state of private enmity between themselves and their mother. In 1889 John Francis drew up a list of income and expenses for his mother Arbella that he titled “Accounts with Mother”. No attempt was made to make a balance sheet (one has now been attempted: 32.5), but the income was £3,508.3.9 and the expenses were a little less. Most of the rents were paid in arrears, some going back to 1884; they were collected by an Agency who paid in £3,187.3.0 and took 5% (£159.7.2) for their services. John Francis has not detailed the Agency figure but he has included income, which did not go through the Agency and also some expenditure. The Head Rent of Oakley Park of £85.13.11 for one year went to Lord Headfort. Charles Reilly received “one year’s wages, £35.9.6” for supervising the work on Oakley Park. The money from his lease of 52 acres must have been paid to the Agency. Much of Knockstown and Drumlargan was leased by “George A. Tisdall £320”. George Archibold Tisdall, 1860-1922, JP, was a barrister in Dublin and a relative of the Tisdalls of Charlesfort, Kells. This is the only reference to him and it is difficult to see how he fitted in to those lands; even if he was a middleman he should have shown up in the Valuation Office records. Some of Knockstown was leased by “E Bomford’s ½ years rent, £33.5.0”. This was the 61 acre farm, which Elizabeth was given in 1866. The caretaker at Drumlargan was John Larkin whose wages for 2½ months was £1.2.3, and the herd was “L. Clinch, wages 4½ months £7”. Clinch paid back £2.1.0 for grazing his cattle on that part of Baltrasna leased by Christopher Barry of Little Ardrums. John Francis leased parts of Baltrasna and Clonfad for £73. Mulvanny paid £2 for his cottage and garden in Baltrasna, and “Judge, Flanagan & Fetherston H” paid £1.15.6 to cover some of their rent of Clonfad. The bailiff of Clonfad was John Connor who was paid £1.3.4 wages for 4½ months; he farmed 25 acres of Clonfad. Arbella withdrew £70 in cash. The settlement of £2,000 a year on Arbella, which the land of Oakley Park had to produce. This figure must have come from George’s will which has not been found; it is not the figure in their marriage settlement which was only £300 a year. “Mrs G. W. Bomford jointure and succession duty, 6 months, £119.6.9”. Arbella had been made the sole executor of George Winter Bomford’s will and no doubt much of this payment to Flora Mary was due to that. ‘Succession Duty’ implies the entail of Drumlargan. “J. F. Bomford’s marriage settlement, £400 at 5%, £7.10.5, paid to trustees”. The marriage settlement which has been found does not include the amount of money, only that it was to be charged on Oakley Park, Cluide, Baltrasna and Clonfad. On 5th March 1875 John Francis signed a receipt for £10 from his father being a half-year interest on £400 at 5%. “Major S. Bomford’s interest on £12,300, 6 months at £296.15.0”. “Colonel Robert Caulfeild’s interest on £2,000, 2½ months at £21.3.6”. “Colonel Robert Caulfeild’s three years interest on £1,500 at £180”. The last two are a mystery; there is no documentation on them. The Colonel (1829-1905) was a nephew of Rev Thomas Gordon Caulfeild who died in 1875 without children (31.1); he may have bequeathed the £1,000 mortgage on Drumlargan and Clonfad (31.2.1), but if so then it was the penalty figure of £2,000. The £1,500 mortgage might possibly be the penalty figure of the £800 mortgage on Oakley Park (31.2.2), but how the Colonel got this from George Ruxton and Richard Knott Bolton is not known. There is no further documentation on the Rev Thomas Caulfeild’s £1,000 mortgage or on the Ruxton / Bolton one of £800, so either the above supposition is correct or they have been paid off and these are new mortgages. Another mystery concerning a £2,000 mortgage is on a sheet of paper dated 31st October 1874. It reads, “I acknowledge to have received from John F. Bomford Esq. the sum of £49.11.8, which with 8/4d deducted as income tax makes up the sum of £50, being one half years interest due to me by George Bomford Esq.” The only certainty about the signature is that it is ‘Caulfeild’; the initials could be ‘JWG’ or ‘TWG’. Colonel Robert’s eldest son, Francis William John, might be the answer but he was only born in July 1859 so was only 15 in 1874. The Rev Thomas Gordon Caulfeild, Arbella's sister Elizabeth's husband, is another possibility, if he had a middle name (20.6). In that case, the interest would be on the same £2,000 as that on which Colonel Robert Caulfeild got interest of £21.3.6 for 2 ½ months (equals £50 for 6 months) at 2 above, ie the mortgage outlined at 31.2.1. The only other mortgage is the Hinds one which the next deed (31.4) appears to terminate; it includes much of interest, which has been made use of elsewhere. However these accounts would not be complete without the following payments due to Arbella and which might be part of these accounts of 1889. Eight ten-pound shares in the Farmer’s Gazette now the Official Guide. Gross value of property £3,500.0.0. “Mrs Caulfeild” was probably Arbella’s sister Elizabeth who actually died in 1834 (or 1885? - see 20.6) but her husband, Rev Thomas Gordon Caulfeild, did not die until November 1875. “Miss Winter” was probably Arbella’s aunt Anna Maria Winter who died in January 1837. Winter family tree. 2. Adelaide Potterton of 22 Albert Road, Kingstown, Co Dublin, spinster. 3. Arbella Bomford of Oakley Park, widow. 4. John Christopher Bagot of Ballyturin, Gort, Co Galway, (husband of Anna Catherine (Fleming), niece of Elinor and John Francis), and William Eden Holmes of St Grattan, Monks town, Co Dublin. 2. The indenture dated 15th February 1861 (Re-assignment by Samuel Bomford of his £4,000 as a mortgage 26.4.1). 3. The will of George Bomford and probate granted on 15th October 1886 to Arbella Bomford (32.3). 4. The death of John Thomas Hinds, intestate, and that no new trustees have been nominated. 5. That Adelaide Potterton was granted letters of Administration of John Thomas Hinds on the death of his wife, Emma Hinds. 6. The Order of the Master of the Rolls concerning the 21st March 1809 marriage settlement in which, on 24th April 1899, Robert Laurence Bomford and Anne Bomford were appointed the new trustees of the lands and premises for 300 years. (The first trustees were Henry Hamilton who died in 1844, and John Pratt Winter who died in 1846; then they were Thomas Barnes of Westlands who died in 1871, and George Lucas Nugent of Westmeath who must have died about the same date). 7. The Order of the Land Judge of the Chancery Division of the High Court of Justice dated 14th November 1894 made in the matter of the estate of John Francis Bomford, owner, and Robert Neville, petitioner, concerning the principal sum in the mortgage of £3,236.5.9 still due on the lands of Drumlargan, Ornellstown, Knock and Monaloy. Now John Christopher Bagot and William Eden Holmes have paid this mortgage out of moneys belonging to them by the direction of Robert Laurence Bomford and Anne Bomford, and Adelaide Potterton as the personal representative of John Thomas Hinds. Thus ends the Hinds mortgage, but really it has only been transferred into the hands of Jack Bagot and William Holmes. Mortgages after 1900 have not been studied so this matter is left open-ended. Many of John Francis’ mortgages were initiated during his father’s lifetime and the original intention was to include only those, but since the Registry of Deeds records have been investigated up to 1900 but not after, it was decided to list all the mortgages here. 1. £1,600 against Oakley Park, Baltrasna, Cluide and Clonfad. In the deed dated 2nd June 1880 (Vol 30, No 92) Christopher Barry of Little Ardrums, south of Agher, grazier and salesmaster, agrees to lend John Francis of Drumlargan £1,600 at 6% interest against the lands of Laurencetown or Oakley Park containing 466 plantation acres (755 statute), and of Baltrasna being a sub denomination of Galtrim containing 293 plantation acres (474 statute), and of Cloodecacagh or Clude in the Barony of Ardee. E by the lands of Oakley Park, the estate of George Bomford. In a later deed of 29th October 1896 (Vol 69, No 147) John Francis passed the mortgage to his eldest son George Lyndon Bomford. It recites the lease of March 1861 and covered the same 207 acres. So John Francis leased to his son the same parcel of Oakley Park, which his father had leased to him on the back road with the ‘new’ farmyard. Whether GLB took over the whole £1,600 mortgage or only that part applicable to Oakley Park is not known. In January 1881 George leased 18 statute acres of Baltrasna to John Francis for 31 years at a rent of £100. In April the same year John Francis sold the lease to Christopher Barry for a loan of £250 with the principal sum of £400. These four deeds have been put together simply because they are for £1,000; it is possible that there was more than one lot of £1,000 but it is thought that there was only one. 2. 9th October 1880. Elizabeth Bomford, spinster, and Robert Laurence Bomford, both of Oakley Park and over the age of 21, took John Francis to court. “In the High Court of Justice, Exchequer Division, the plaintiffs obtained judgement against John Francis Bomford for £1,000 plus £3.3.0 costs.” The lands are all listed. Just why these two younger children were going to court against their older brother, when their parents were both alive, is not known; but Elizabeth and Robert eventually were to become executors of both their parents wills, and they were also to cause a split in the family due to their treatment of their mother (Chapter 32), and, perhaps, this is an early example of the division in the family. 3. 8th May 1885 (Vol 22, No 110). In the High Court of Justice, Queen’s Bench, Arbella Bomford, wife of George Bomford swears that on 8th May 1885 she got a judgement against John Francis Bomford of Drumlargan for £1,000 and costs of £3.1.1 which sum remains outstanding. John Francis Bomford of Drumlargan, tenant farmer, received a loan of £425 from the Commissioners of the Public Works for work to be carried out on Drumlargan. More improvements on Drumlargan, but note that John Francis carefully and rather unusually describes himself as a “tenant farmer”; this no doubt has to do with the entail and the row with George Winter Bomford’s family and John Francis over the inheritance of Drumlargan (32.1). John Francis Bomford of Drumlargan, JP, mortgaged for £1,700 to the Hibernian Bank Ltd of 27 College Street, Dublin, the land of Drumlargan containing 336 statute acres. It will be remembered that in 1865 John Francis had 705 acres of Drumlargan (29.3), and his father was the occupier of the rest. In 1878 John Francis terminated this lease with his father; however a new lease of which there is no record was then made for 337 acres around Drumlargan House, and it is this land, which the mortgage concerns.